At the end of issue #1 we saw the introduction of a group of two individuals standing above a mass gathering of supporters. Their names were Tetu and Zenzi and in this issue we begin during an executive debriefing of events. We find out that at least Zenzi (and likely Tetu too) are Nigandans. Niganda is a bordering nation to Wakanda and it is explained that during one of the Eric Killmonger's final acts of treachery against Wakanda, he employed the aid of Nigandans and promised them power if they helped to overthrow the Wakandan government with him. When things went south, Killmonger turned on the Nigandans and killed a bunch of them and dumped their bodies into a giant ditch. Well, Zenzi is a product of those anti-Wakandans and she is the one who is behind the recent uprisings. T'Challa has tracked Zenzi to a region known as the 'Frontier' which is along the border of Wakanda and Niganda and wants to go alone to confront her. 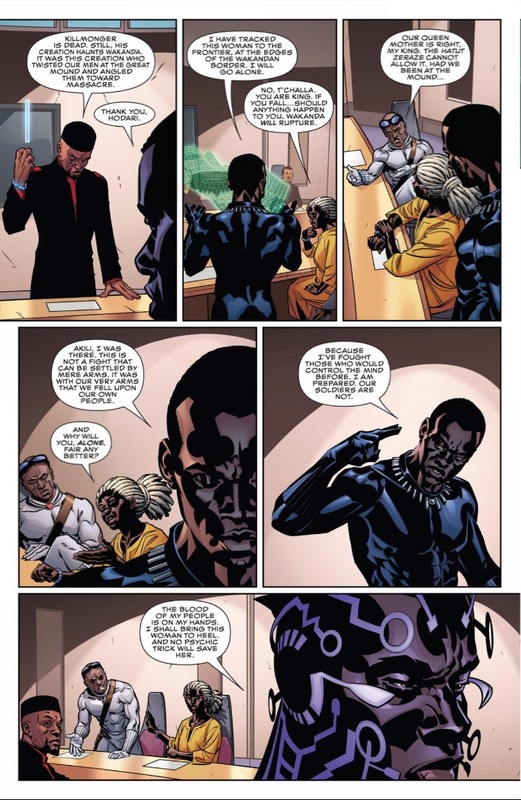 The Queen Mother tries to persuade him not to due to his status as King, and for the first time we see a representative of the Hatut Zeraze in this new run of Black Panther comics. They too are an important element in the world of Wakanda and act in roles that see them portrayed as secret police, spies and at times assassins. This man's name is Akili, and we have yet to see what type of role he will play in the internal workings of the Wakandan government but he agrees with the Queen Mother. T'Challa confidently (and some might say stubbornly) disagrees with both and exits as we see the high-tech synthetic weave of his Black vibranium armor encase his face. Once he reaches the Frontier at the Nigandan border region, we see him quickly and easily dispatch a handful of militia soldiers with ease. We see him continuing through the compound taking on more soldiers by himself. While he's fighting, he is recalling when his Uncle handed the throne to him when he came of age and was ready to rule. His Uncle became King after his father T'Chaka was killed when he was a young boy. The MCU film 'Captain America: Civil War' has changed this origin story up a bit however. I have to say the artwork is incredible and I am loving the way artist Brian Stelfreeze is portraying the people and environment of Wakanda. Artwork can make or break a comic to me, and not only is the story engaging and interesting with a strong political undertone, but the character design is imaginative, eye-catching and rich. We see the Black Panther finally break through the militia guards and confront the Nigandan woman Zenzi who has been plotting the uprisings in his country. He tells her not to try to get into his head, and she responds by saying why "try to get into your head, when I can devour your heart?" Almost as if Zenzi put the Black Panther into a trance, we then see T'Challa having visions of events in his past that weigh heavily on his heart. This is when we delve deeper into the character development of T'Challa as we see how he views himself. He still struggles with the "death" of his sister Shuri (I'll explain the quotations in the second) and sees her in a vision saying he is no King and asking him why he let her die. T'Challa is able to fight through the vision and comes to surrounded by a group of Nigandan soldiers. Black Panther does his thing of course and handles them with ease stating to himself that he knows who he is now; he is might, he is rage and he is shame. T'Challa realizes that Zenzi's power is in her ability to reveal to you all of the awful feelings and thoughts we have hidden away inside us. 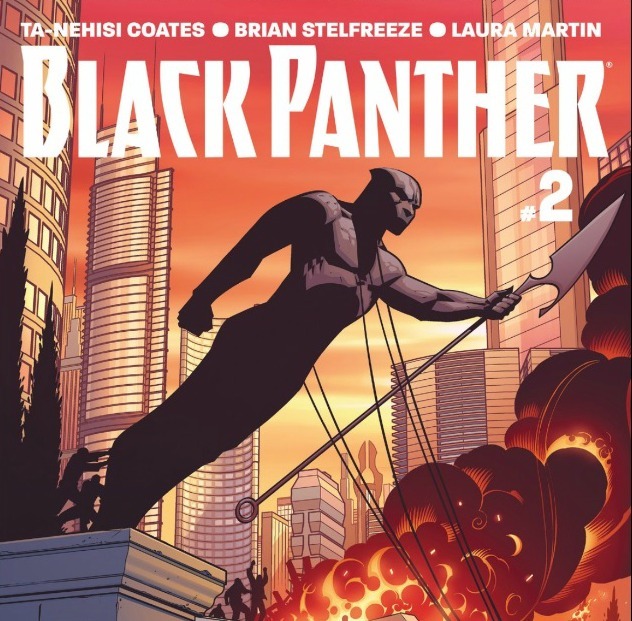 After the soldier's are disposed of, Zenzi is nowhere to be seen and the Black Panther returns to the Necropolis to mourn the supposed death of his sister Shuri. Above I put quotations around the world 'death' when referring to his sister because until now it has been believed that she was in fact dead. Well now it appears she may not in fact be dead after all. While her body floats in stasis in the Necropolis (with the apparent intention of preserving her body), we see that one of her eyes are open in fact. As T'Challa exits, he says "Queen Shuri did not live, nor did she die." To end the T'Challa arc in this issue, we see Shuri in what appears to be a dream state. 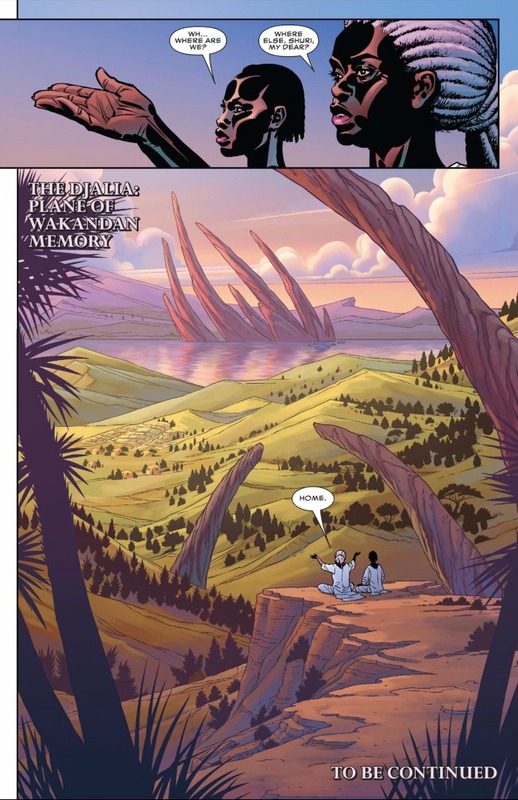 The Djalia - Plane of Wakandan Memory - is where we find Shuri speaking with someone who looks identical to the Queen Mother. Whether that really IS the Queen Mother, another being, or a mental projection by Shuri on this "Plane of Wakandan Memory" remains to be seen. It is beautiful regardless and this is why I said Brian Stelfreeze has done an amazing job as artist. I don't know about you, but I can't wait to see Shuri's return to the realm of the living. The other major story arc in this issue continues the renegade mission of the two fallen Dora Milaje members Aneka and Ayo who can be called the 'Midnight Angels' from now on due to their theft of the prototype Midnight Angel power suits. We see the Midnight Angels raiding another bandit compound compound in Northern Wakanda. This treacherous and evil place held innocent women captive to be used by the bandits there. This is meant to be yet another sign of the social decay of Wakanda and the weakening of the Wakandan throne post-Secret Wars. The Midnight Angels say that they are vermin and vultures who are feeding on the social decay of the country. In the eyes of the Midnight Angels, they have taken matters into their own hands because they feel the 'Golden City' (Capitol of Wakanda) is too afraid to challenge the growing insurgency and violence in the country. Once it is all over, Ayo states that she does not believe "they" (meaning the bandit men attacking women throughout Wakanda) can be reasoned with. Aneka says no and Ayo says good...this all happens as a group of the women they saved came up to them thanking them and demanding that "they all pay." The Midnight Angels express their discontent in how the Wakandan government has handled the situation and that as long as they breathe then "they will all pay." After the events in Northern Wakanda are over, we see Ayo and Aneka hiding away on a riverside under a tree with a city nearby in the background (and the ARTWORK man!!). There's a discussion about what their plans are going to be post-prison break (see Issue #1) and now that the raid is over. Aneka pulls out a 3-D map of what can only be Wakanda with 4 different locations plotted on the image. She calls this their "plan," so most likely this represents more bandit locations and corrupt chieftains who are destroying the lives of women around the nation. It'll be interesting to see where this subplot goes and if they will mend fences with T'Challa. Before ending this blog entry, I wanted to add in the other element of the Zenzi/Tetu subplot. When the Black Panther approached Zenzi earlier, Tetu was nowhere to be seen. We briefly see him in a city called Hekima Shule in what seems to be a region or state called Birnin Azzaria. As far as I'm aware, this is the first time this location has appeared in a Black Panther comic (if I am wrong, leave a comment below). It's not clear if this is in Wakanda and just another state within the kingdom...or another country altogether. The most important thing however is the discussion Tetu is having with an old teacher of his. The panel begins with Baba (the older gentleman) asking the class to ponder on how the weak should marshal justice against the powerful. Tetu enters and rhetorically asks Baba to answer that question himself as the class leaves for the day. It is here that we find out that Tetu used to go to that University before joining the woman who Baba calls 'the Shaman' who is obviously Zenzi. Tetu pronounces that he has founded an Order to "protect" Wakandans as their King (T'Challa) destroys them. He basically calls Baba weak, someone who wants to stay in the comfort of the University and theorize and speculate while no one does anything. The subtext of what's being stated is actually very powerful and shows what writer Ta-Nehesi Coates brings to the table. Follow Black and Intellectual on Facebook, Instagram, Pinterest and Twitter and be on the lookout for more Black Panther in the months to come. The story is shaping up very nicely and I get the impression we're only at the tip of the iceberg!